-is there any way i can get this to be cheaper? -will i need adapters or is it all included? -how much range should this get? That looks like all the parts you need except for any building tools you might want to use. I don't see how you can make it cheaper. This looks pretty bare bones to me. Looks like you'll have all the parts needed since everything else you need looks like it's included in the kit. Range on that radio should be about a kilometer since it says "full range" but depending on your area it might be reduced somewhat. Best thing is when you get to the field, make sure to perform a range test to gauge distance better. I know that i am missing the AV transmitters and recievers, but is it possible to hook up an AV reciever to a laptop or to a monitor? Also- how fast do you think my current setup will fly? The T4A makes a good backup transmitter or a take anywhere unit. Drop it, scratch it, leave it in the car and forget about it. This is what the T4A is all about. 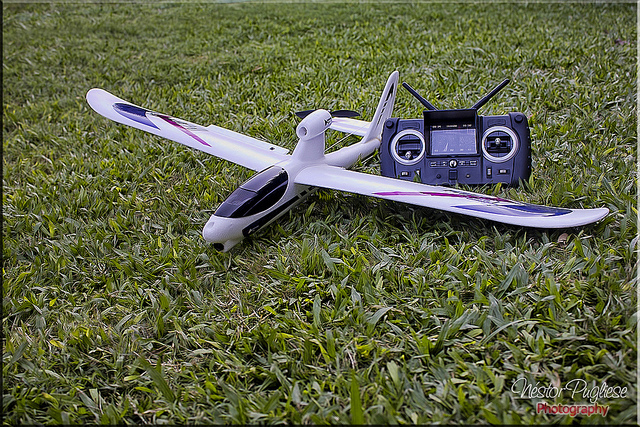 Not suitable for the multi flapperon, mixer, vtail, FPV, robot controlling hobbyist. yet another thing: would it be possible to increase my range? To a monitor, provided you have the proper adapters/inputs. Most computers don't have the correct inputs for that. Most receivers for video have only the composite video output, which is to say, the single yellow RCA type plug. Now this can actually be wired many different ways, but ultimately, whatever you view the picture on has to be compatible with that signal. It is always possible to increase range. Though I think you will find that 1k is really far. My furthest flight was just under two miles and not very pleasant. If not for my wife/spotter and her wicked cool astronomical binoculars, I don't think we would have made it. Actually, it is. When I said composite, I meant the signal. I was using the yellow plug to illustrate the most common utilization. The yellow wire caries the video signal and the black wire is the ground for both the video and the power. If you hooked the yellow wire to the center pin and the black to the outer part of the RCA plug and plugged it into a monitor, you'd have picture. do you have a camera onboard, or is it just that hard to find it? also- do you know why the styrofoam base is like $44 just by itself? What base? Camera base or...? whoa whoa whoa. How would it be possible to do this? Hull of aircraft plus one prop and some pins. $44. No servos, no motors, no electronics, $44. Sorry, I was worried I might lose you there. If you were to cut open an old composite cord you had laying around, you'd find only 2 wires inside. Usually, it's an outer braid that carried the ground part of the video signal and also acts as a shield for the inner wire, which carries the actual video signal. Connect yellow to center pin of RCA plug. Connect black to both -12v and outer part of RCA plug. White isn't used unless you have audio capability...so, we'll leave the out to keep it simpler. I may actually do that, but the problem right now is the price for the hull. This post wouldn't be here if it included motors and servos, but no, none. I know that seems steep, but the cost of the little stuff adds up faster than you'd believe. All those servo horns and motor mount, and such...Plus, there is more than just foam there. There are wing spars and fuselage stiffeners which are likely carbon fiber that you can't see. Is it coincedence that both articles are yours? I think not! But thanks FM, you've said it far more eloquently that I ever would have in those! Yes and yes. Its easy to get disoriented. If you have a laptop use an Easycap (about $10 on ebay). This is a video capture device that plugs into your USB port. It supports the rx and you can record the flight but nothing beats goggles.